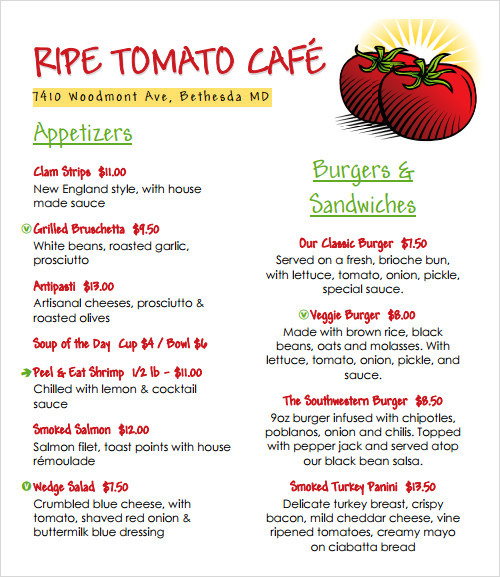 A well designed menu card plays a big role in ensuring that your restaurant remains fresh in your customer’s mind. A menu card plays a big role in determining the personality of your restaurant establishes a budget and helps the owner to earn profits. 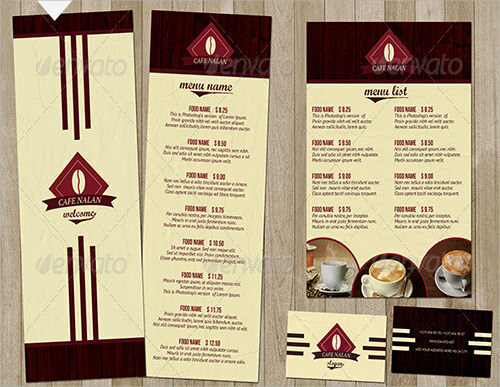 Here are some designs of Menu Template that we hope the varying needs and taste of different food joints. This example of sample flight menu is used by different air carriers for their first class passengers. The menu has double monochromatic border right at the top of the page. Images of several drinks and food samples are priced along with the price tag to help customers decide what item they would opt for. 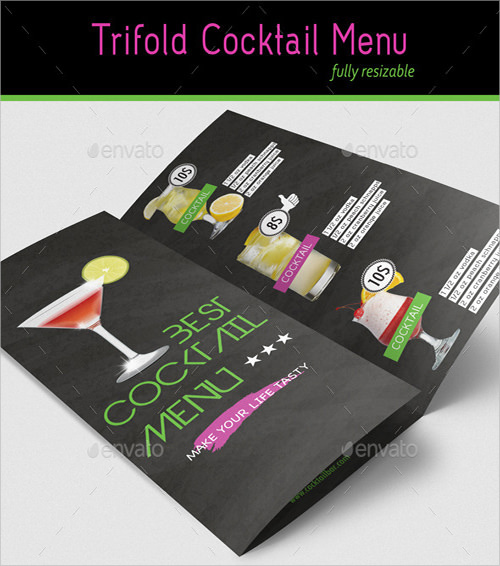 This sample bar menu is designed on a black background and contains images of various types of cocktail and mocktail glasses. The price of the drinks is specified on the right hand corner and also on the matching class. The size of the menu card is 216X279 mm and supports CYMK colors. This sample dinner party menu comes in a bi foldable format and 4 color and design variant. The size of the menu card is 200X210 mm and contains a text that is completely customizable and has a logo included in the design. This template can be printed directly at home and supports CYMK colors and 300 dpi. This sample menu design in pad comes in Photoshop file format and sports bright orange and black color. The template is fully editable and the background color can be changed to four different types of colors. This template is available A4 format and has a clean design with highly organized layers. 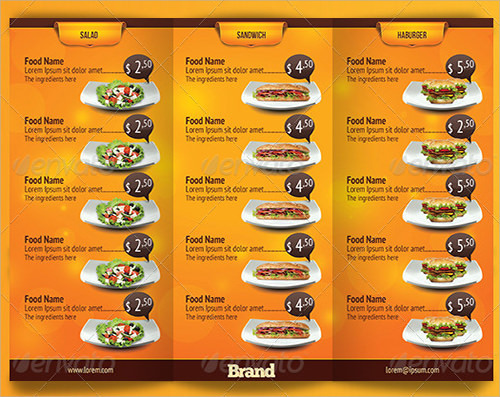 This sample food menu is meant for small food joints at popular locations. In this given example the sample is about sea food. This menu is completely covered with interesting images that enhances the visual appeal. This sample proves that the menu supports 300 Dpi and 4 different types of colors. This example of sample wedding menu is designed entirely on a white background with very elegant patterns on the corners of the page. However the background and the colors of the frame can be changed as per the need of the customers. The dimension of the frame is 8.5X 11 inches and includes other features like the CYMK colors and 300 dpi and comes in entirely printable format. 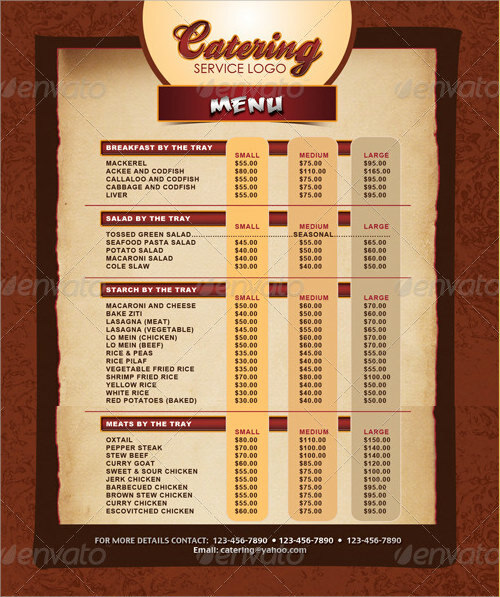 This sample restaurant menu template has a very funky design with fonts that are quite nontraditional. It is a single page menu card. The dominant color is red. The template has designs of two ripe tomatoes on the upper right hand corner of the page along with red borders on all four sides. The menu is divided in three pages and contains the name of the recipe along with the price tag. 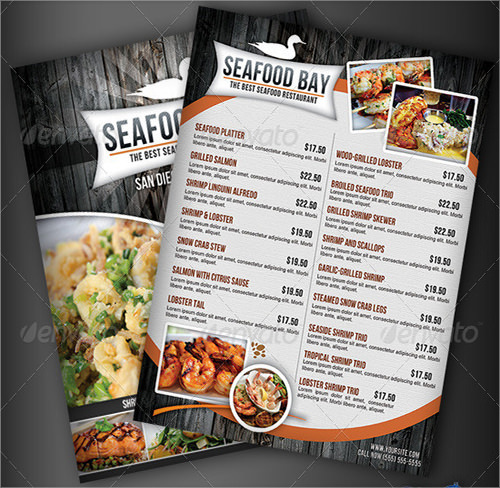 This example of sample restaurant menu design is very sophisticated and meant for any upscale restaurant. 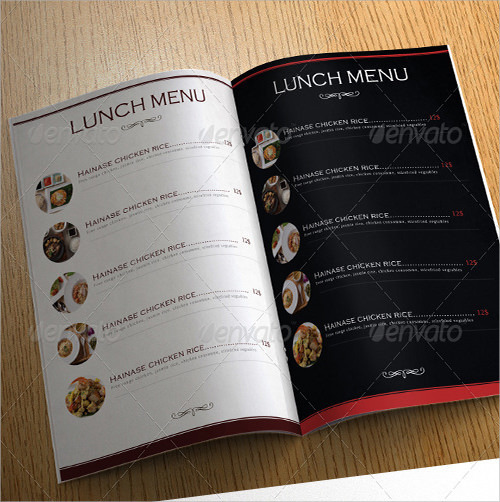 The menu comes in PSD format and has two versions namely white and black depending on the dominant color scheme. Each page has a design of the most popular item from the list. The menu has complete details and contact information of the restaurant in the first and last page. This sample banquet menu is meant for caterers and food supplier to big event and shows. It is a simple menu with the image of a prominent dish on the front page which can be customized as peer demand. The dimension of the template is 5X7.5 inch and is available in PSD format. This sample diet menu is a very simple template with the main food items divided into three main meal of the day, namely breakfast, lunch and dinner. It follows a minimalistic design and the menu is based on a nutritious diet plan. 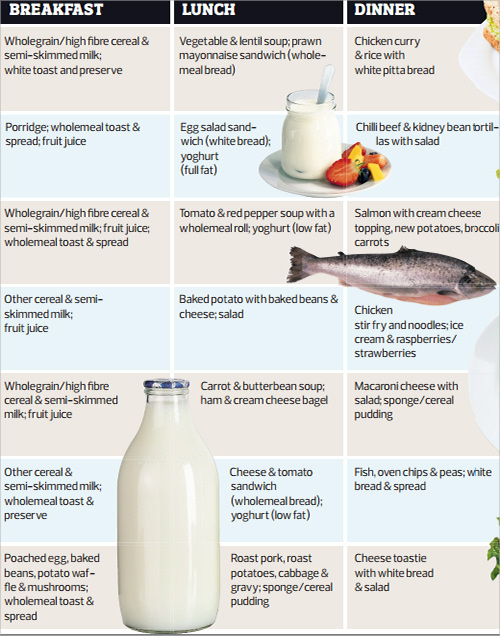 Images of simple food items are used and the food items are divided into 7days format. 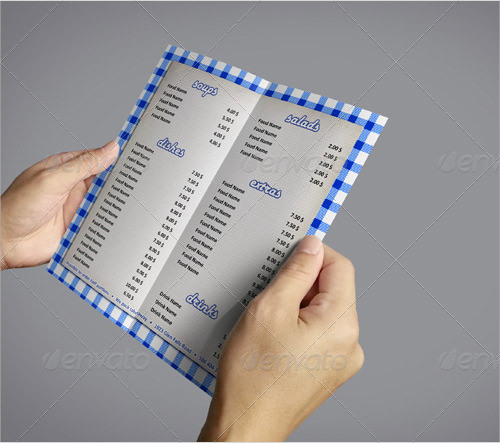 A menu card is one of the first things that a customer’s comes in contact with while visiting a food joint, hence it is important that he gets a good feel by surfing through the pages. 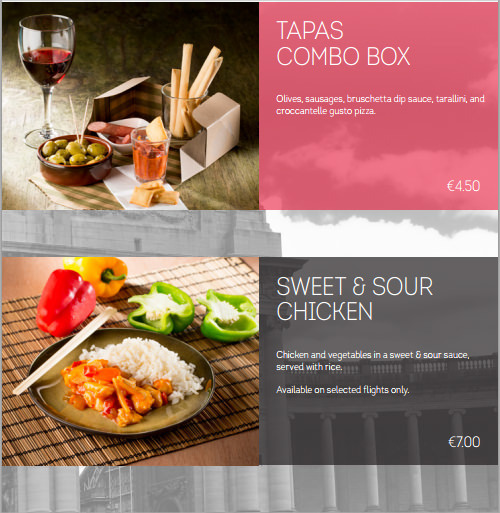 The templates given above would surly help you to design a wonderful menu that would keep your customers coming back for more every single time.